Matrix Insights Resources – Why should you care about Emotional Intelligence and Emotional Competencies? 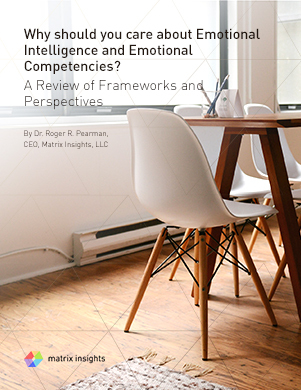 Whitepaper: Why should you care about Emotional Intelligence and Emotional Competencies? Why should you care about Emotional Intelligence and Emotional Competencies? The central role of emotions to human performance and health has taken center stage in the last decade. The scientific basis for looking at the role of emotions has become exponentially enriched with work from neuro and behavioral scientists. While the neroscience and biological research into emotions has yielded important insights regarding the profound way emotions are integrated into human percpetion and judgment, the role of specific behaviors that reflect the use of emotional energy is embedded in the Emotional Competencies used by Matrix Insights. Complete with definitions, clusters, and explanations about 54 mission critical emotional competencies, this report gives you the background and overall perspective of why Emotional Competencies are central to effectiveness.